The blacklisting of Rio Tinto – Opinion – Al Jazeera English. Too many invest in companies – such as Australia’s Rio Tinto – without any consideration of the ethics of doing so. Investing in conflict-affected and high-risk areas is a growing concern for responsible businesses and investors. Often times companies based in developed countries operate in lesser-developed, foreign markets, where governance standards are lax, corruption is high and business practices are poor. These pieces focus on one specific Anglo-Australian company that operates in West Papua, one of the poorest provinces of Indonesia. The risks for the company include the potential to contribute to environmental and social damage in a foreign market. The risks for investors include financing a company that does not get its risk management right. This is the story of how the Norwegian Pension Fund blacklisted Rio Tinto. An ancient copper mine located near Huelva in southernmost Spain changed hands in 1873. A group of opportunistic Anglo-German investors, equipped with modern techniques that favored mining aboveground, acquired it from the Spanish government. The mine’s copper had stained the surrounding water to such an extent that the indigenes named the river Rio Tinto – literally meaning “red river”. The mine at Rio Tinto had supplied the Phoenicians, ancient Greeks, Carthaginians, and the Roman Empire. Its copper had paid for Carthage’s numerous wars on Rome and had been held by both Scipio and Hannibal. We can only assume that these investors, aware of such indelible marks on the environment and history, missed the irony, because they named their company Rio Tinto. However, the red river has since flowed a long way from home. The company has expanded its operations through Australia, North and South America, Asia, Europe, and southern Africa – across coal, aluminum, copper, diamonds, uranium, gold, industrial minerals, and iron ore. Rio Tinto is now so large that its dual listing on the Australian and London stock exchanges commands a value of over $100bn. What’s left behind near the Spanish town of Huelva is a 58-mile-long river flowing through one of the world’s largest deposits of pyrite, or fool’s gold. Because of the mine, the river has a pH reading similar to that of automobile battery acid and contains virtually no oxygen in its lower depths. In the late 1980s, temporary flooding dissolved a power substation, a mandibular crusher, and several hundred yards of transport belts. More recently, NASA astrobiologists used the conditions of the river to replicate the conditions of Mars. “If you remove the green,” one of them remarked, “it looks like Mars”. The thinking goes that if something could live in such an acidic river, then there is likely to be life on Mars too. Every Australian – through public monies invested by elected governments, or their choice of superannuation fund, insurer, and bank – is funding this red river now too. Rio Tinto is so large and so profitable that, for the average Australian, investment in it is very near unavoidable. On September 9, 2008, amid the turmoil of the global financial crisis, the Norwegian government announced that it had liquidated its entire $1bn investment in Rio Tinto for “grossly unethical conduct”. 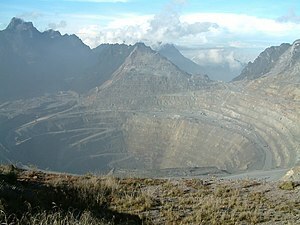 Operating the second largest fund in the world, the Norwegians’ decision focused solely on the Grasberg mine in West Papua on New Guinea, which it believed posed the “unacceptable risk” of contributing to “severe environmental damage” if it were to continue funding the Anglo-Australian mining giant. Rio Tinto had been blacklisted. The following day, Rio Tinto’s official statement relayed that the company was “surprised and disappointed”, given both its recognised leadership in environmental sustainability and its noncontrolling interest in the Grasberg mine. As with most claims of sustainability, the truth is otherwise. Rio Tinto should not have been surprised by the Norwegian stance on Grasberg. Records show that there had been months – in fact, years – of dialogue with the Norwegians about Grasberg’s inadequate environmental and social performance. Rio Tinto had faced a litany of signposts indicating that multinational and Indonesian involvement in West Papua was not meeting various standards, laws, and norms: Institutions such as the World Bank, the Australian Council for Overseas Aid, the International Finance Corporation, the Overseas Private Investment Commission, the United Nations Committee against Torture, the US State Department, and the Indonesian Environment Ministry, as well as many US and European politicians, independent environmental assessments, international media, Papuan leaders, civil society groups, and shareholders had brought the problems to Rio Tinto’s attention. That an institutional investor should act on environmental, social, and corporate governance considerations is a newly evolving development within the global investment industry, and one in which many Australian institutional investors and service providers have been quick to claim leadership. However, the blacklisting of Rio Tinto by the Norwegian government was uniquely public, transparent, and forward-thinking. Yet this wholesale dumping of one of Australia’s blue-chip stocks received only syndicated coverage in the local media. Behind the headlines of the global financial crisis is a deeper, more systemic fault line that rewards rampant capitalism. Too many invest in and operate mines such as Grasberg without any consideration of the ethics of so doing. This is an extract of a chapter from the book, Evolutions in Sustainable Investing: Strategies, Funds and Thought Leadership, to be published by Wiley in December 2011.